Scarves were raised in the countdown to the opening of Minnesota’s US$200m state-of-the-art stadium, as the club held a Scarf Raising Ceremony. With industry eyes on Tottenham’s new stadium opening in London, we thought it would be timely to share some news from our friends across the pond in Minnesota at another highly-anticipated football stadium opening. 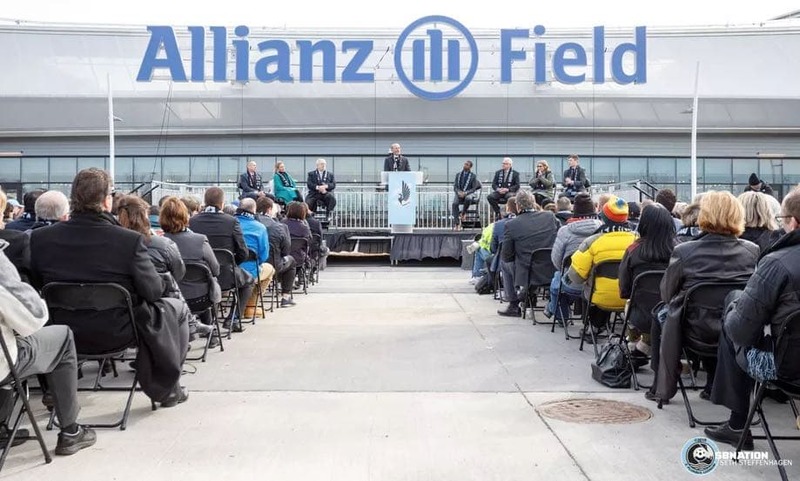 Earlier this week, Minnesota United FC revealed Allianz Field to key stakeholders with this ‘Scarf-Raising Ceremony’. Among those speaking at the event were MLS commissioner Don Garber, Minnesota governor Tim Walz, lieutenant governor Peggy Flanagan, St. Paul mayor Melvin Carter III, Minneapolis mayor Jacob Frey, and Allianz Life CEO Walter White. During Don Garber’s speech at the ceremony, he praised the work done by the team and local government in between a steady stream of jokes drawing on from his previous experiences of his life in Minnesota. Minnestoa United FC will play their first match on Saturday 13 April hosting New York City FC at Allianz Field, the state of the art stadium with 19,400 capacity.